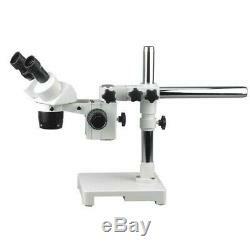 AmScope SW-3B24 20X & 40X Stereo Microscope with Single-Arm Boom Stand. 20X and 40X super widefield magnification settings. High quality optics offers crystal clear stereo images. Sturdy single-arm boom stand with cast steel solid base. Large field of view and long working distance. 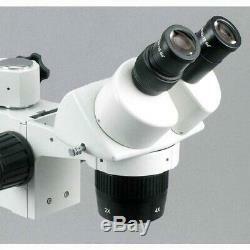 This binocular stereo microscope gives 20X and 40X magnification settings with sharp clear images and high resolution. It comes with super widefield and high-eyepoint eyepieces and a single arm boom stand. It offers large working distance and versatility. It is an ideal instrument for research labs, gemologists, collectors, engravers, and anyone in semiconductor or electronic industry. High Resolution with Great Flatness and Contrast. Binocular Head with Super Widefield Eyepieces. Both Ocular-Tubes with Adjustable Diopter. Single Arm Boom Stand with Solid Base. Optional Fiber Optical Illuminator or Fluorescent Ring Light. Manufactured under ISO 9001 Quality Control Standard. Head: 45 degree inclined 360 degree swiveling binocular. Interpupillary Distance: 2-3/16" - 2-15/16"(55-75mm). Boom Stand: 16" single-arm (overall length: 24"), 17" high pillar, 9" x 9" x 1-3/4" solid cast steel base. 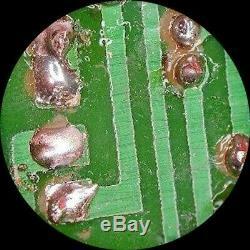 One Binocular Stereo Microscope Head with 2X & 4X Objectives. One Pair of Super Widefield 10X Eyepieces. Single-arm Boom Stand with Focusing Rack. We are more than happy to help you find the right product for you or answer questions about an order you've already placed. But if there is a problem with the item Please contact our support team FIRST! 80% of the time, the problem can be resolved within a few messages. Once received, most claims are processed within 1-2 weeks, stock permitting. Since 1998, America's doctors, researchers, educators, forensic scientists, and electronic designers have trusted AmScope to deliver high quality microscope solutions for their precision educational and research needs. Our products are manufactured under strict ISO 9001 quality control standards, and are made by the same technicians that make much more expensive Zeiss, Leica, Nikon, and Olympus. By designing, manufacturing, and distributing our own AmScope brand microscopes and accessories, we keep products affordable while maintaining quality precision. With over 500 models in stock, we are confident that we can meet your microscope needs whether you're a hobbyist, an educator, or an advanced research institution. Our goal is to assist great minds in reaching that "Eureka" moment. Our promise: When you use AmScope, you'll see things bigger! 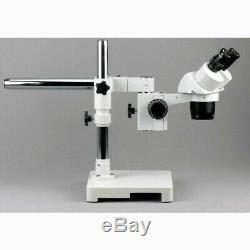 The item "AmScope SW-3B24 20X & 40X Stereo Microscope with Single-Arm Boom Stand" is in sale since Wednesday, March 6, 2013. This item is in the category "Business & Industrial\Healthcare, Lab & Dental\Medical & Lab Equipment, Devices\Microscopes".